Mix all ingredients except chicken together in a large bowl. Whisk to combine. Reserve 1/3 cup of marinade. Add chicken to marinade remaining in the bowl and marinate for at least 30 minutes. Heat grill to medium heat. 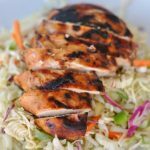 Grill chicken for 10-12 minutes. Baste chicken with reserved marinade. Turn over and grill for another 7-10 minutes, basting with reserved marinade occasionally, or until done. Remove from grill.